"Sautéed onion, green pepper and white rice are simmered in a deliciously flavored broth. 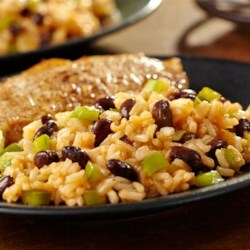 Stir in some black beans and you've got a spectacular side dish that's sure to please!" Heat the oil in a 6-quart saucepot over medium-high heat. Add the rice, onion and pepper and cook and stir for 2 minutes. Stir in the broth and tomato paste and heat to a boil. Reduce the heat to low. Cover and cook for 15 minutes or until the rice is tender. Stir in the beans and cilantro, if desired, and cook until the mixture is hot. Allrecipes Allstar, Melissa created delicious green beans steamed with Swanson®. I used a rice cooker and mexican sauce. It was ok, pretty spicy for me but my husband loved it. Lots of prep x. Certainly more than 2o min. more like an hour. Happy Cooking. I made this tonight to go with burritos I made for dinner! I really enjoyed it! I did add 3tbs of tomato paste and added a dash of chili powder! It was a HIT! I will make this again for sure!! WOW!! This is one of the best recipes I've found on here. The flavor is so rich and extremely satisfying. Highly recommend! I was really bland for my taste :( Sorry ! This was exactly what I was looking for! Perfect rice to bean ratio, loved it!